«We have almost 300,000 Venezuelans who will die if the aid doesn’t enter. There are almost two million at health risk,» said Mr Guaidó at the rally on Tuesday. 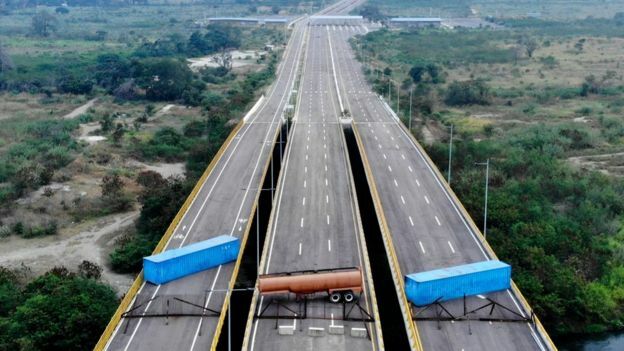 Mr Guaidó, who has been recognised by the US and most Western governments as interim president of Venezuela, told his supporters in the capital that humanitarian aid would be brought into Venezuela on 23 February. Envoys for Mr Guaidó met with Brazilian officials this week and announced plans to create a second aid storage hub in the state of Roraima, on Venezuela’s southeastern border. Mr Guaidó appeared to be relying on volunteers – he called on 250,000 people who signed up online to organise themselves over the weekend, «because we’re going to have to go in caravans». Mr Guaidó last week offered an amnesty to military personnel who break with Mr Maduro, telling them that refusing to allow in aid is a «crime against humanity». Speaking to the BBC’s Orla Guerin, Mr Maduro called US President Donald Trump’s government a «gang of extremists» and blamed America for his country’s crisis. 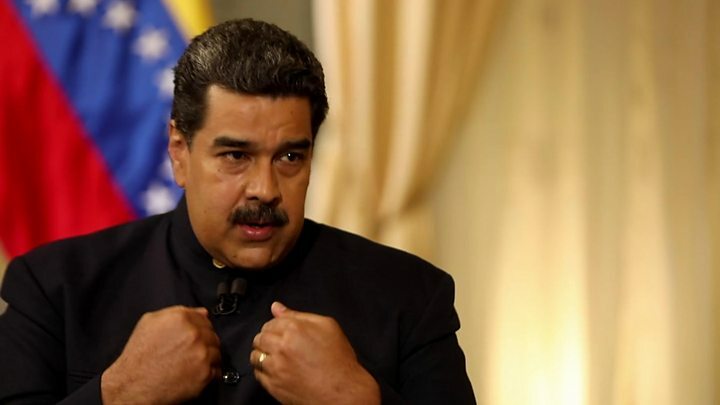 Mr Maduro said he did not see the need for early presidential elections, and reiterated that he would not allow US humanitarian aid into the country. «They are warmongering in order to take over Venezuela,» he said. Venezuela broke off diplomatic relations in response, while Mr Trump said the use of military force remained «an option». The US, which has accused Mr Maduro’s government of human rights violations and corruption, has led international pressure on the Venezuelan president to step down. The Trump administration has imposed a raft of economic measures on the country, including sanctions against the state-owned oil company PDVSA – Venezuela’s main source of revenue. In recent years, the US has frozen Mr Maduro’s US assets, restricted Venezuela’s access to US markets and blocked dealings with those involved in the country’s gold trade. For years Venezuelans have faced severe shortages of basic items such as medicine and food. Last year, the inflation rate saw prices double every 19 days on average. Three million people, or 10% of the population, have left the country since the economy started to worsen in 2014, according to UN figures. Mr Maduro, who has been in power since 2013, was re-elected to a second term last year. But the elections were controversial, with many opposition candidates barred from running or jailed and claims of vote-rigging.